Last week I traveled to Birmingham to deliver the keynote address at ACREcon, the annual conference hosted by the Alabama Center for Real Estate (ACRE). ACRE is a well-organized, statewide commercial real estate group and I was honored to be asked to speak at their event. I was very impressed with the meeting and the record-setting attendance. 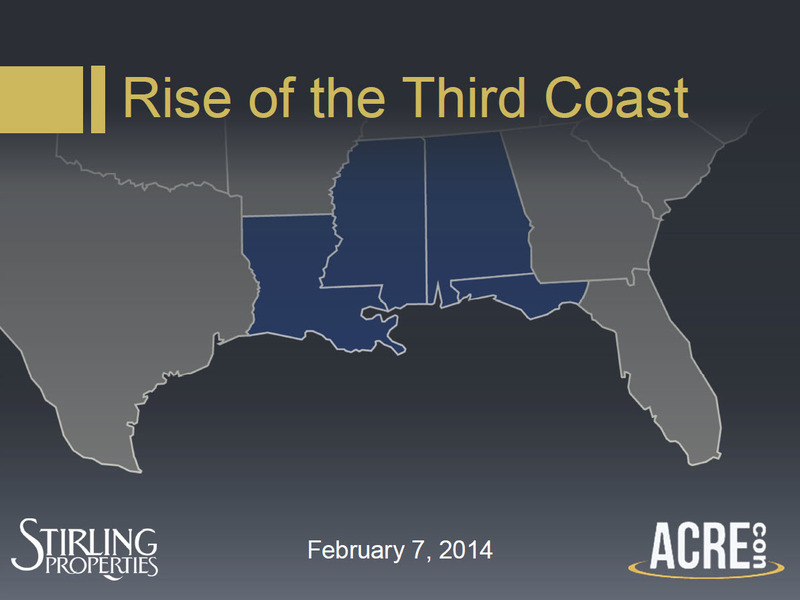 During the presentation, I introduced myself and Stirling Properties to many in the ACREcon audience who weren’t familiar with us and discussed our decision to open an office in Mobile – our first in Alabama. Emphasizing the importance of regionalism, I also discussed the rise of the Gulf Coast into the National spotlight and the significant economic drivers that are shaping the region’s future growth. Click the image below to view the presentation slides from my keynote.